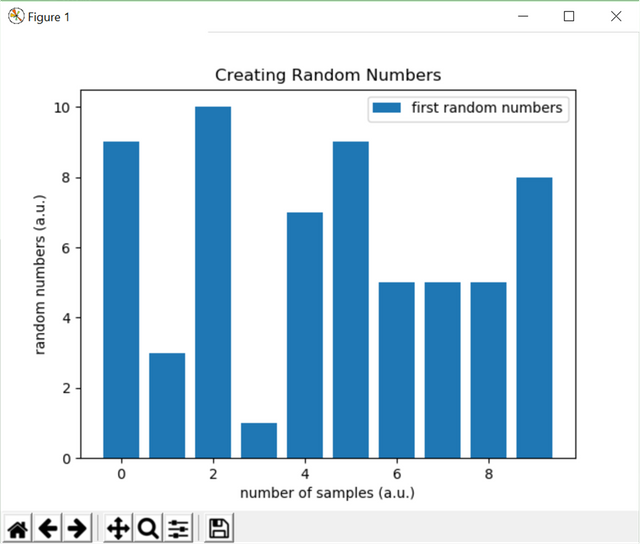 This tutorial covers the topics on getting data from a file by using numpy package and plotting these data by using matplotlib package. PS: If you read the tutorials which are given before, you will see that there is an importance of each tutorial and the aim will be a forming a package for Ultrafast Fiber Optics simulation. 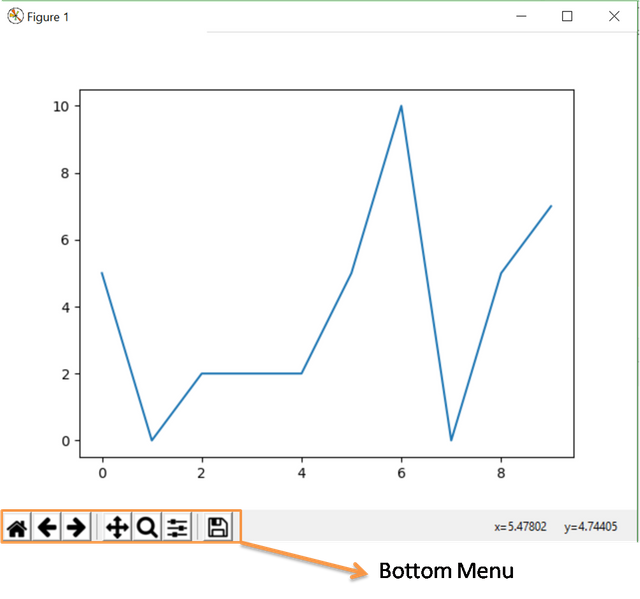 Then you will learn usage of the bottom menu which will appear in the figure. You can easily design your fiigure. Then you will learn how to plot as scattering, bars and histogram briefly. Then you will learn usage of these data and plotting. 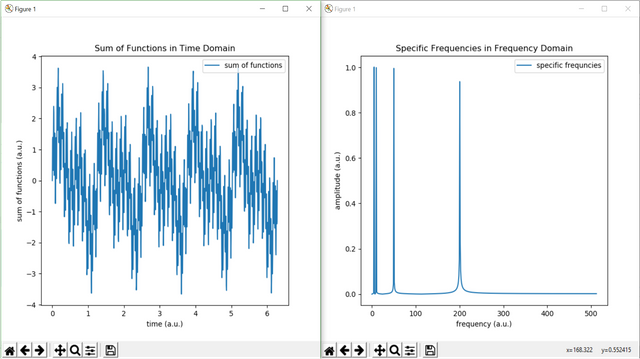 At the end we will give an example of a analysis of a mathematical function which is sum of 4 different sin() and cos() functions and then we will try to analyse the frequency of each functions on a graph. To do that will use scipypackage which is a scientific program package. Firstly, to work on numpy, matplotlib and scipy packages, we need to install these packages. To install the package we will use PyCharm Community Edition 2017.3.4 x64 and also you can find the installment of the packages in detailed in our previous tutorials (given in curriculum part). We will start our code by importing the packages which will be used in the next parts. You see "as" function, this is for heritaging. It means that for each command we do not need to write matplotlib.pyplot or numpy, just we need to write plotting and importing modules respectively. 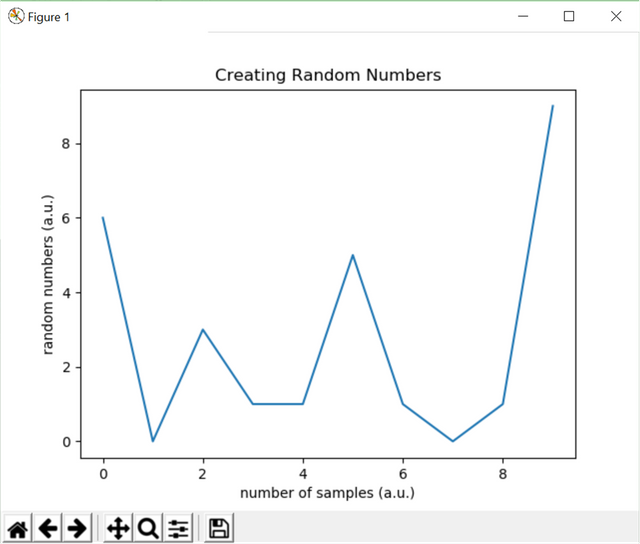 Now, we will try to explain the matplotlib package. 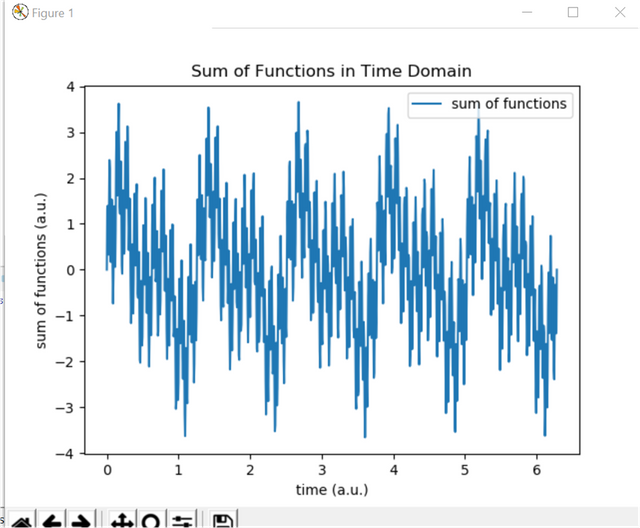 This is a plotting package and you can plot your data in terms of line, scattering, bars and histogram. To show that we need to create two matrix (Mx1), one column is for x-axis and the other one will be for y-axis. 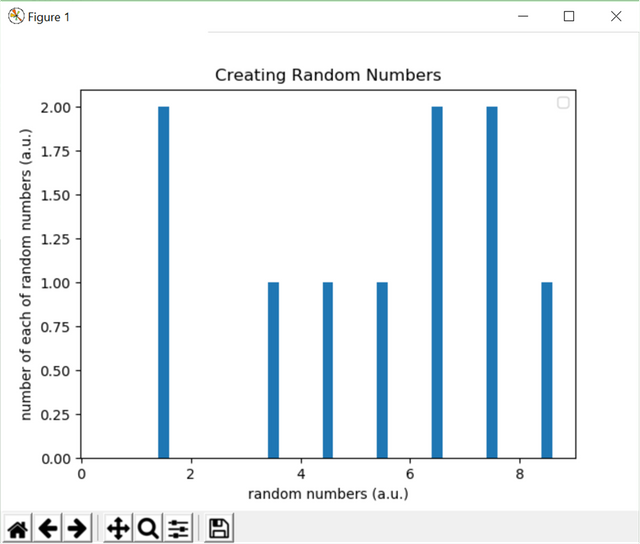 Let's create it by using random function by using random2 package. 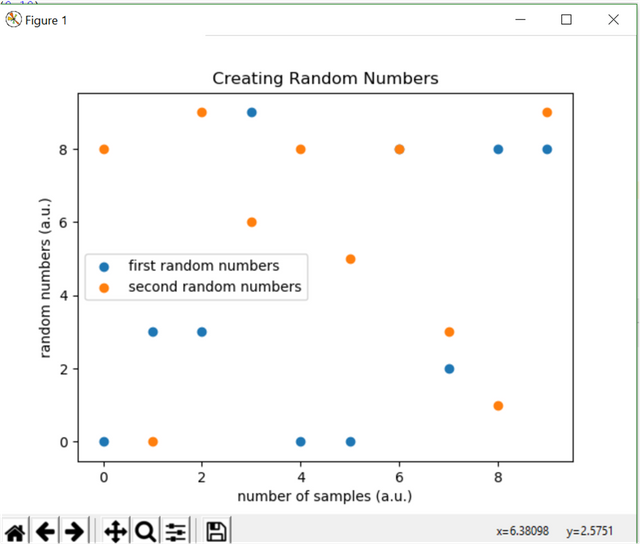 For random number we will use .randint methods. .randint(a,b) where a and b is the boundaries of the random integers creates random integers. Up to now, we just create our two (10x1) matrix now we will plot them and give title, axis name and legends. As you see .plot method is just creating a plot but not seen. To see the plot we need to use .show method. Maybe you are confusing with plotting module. 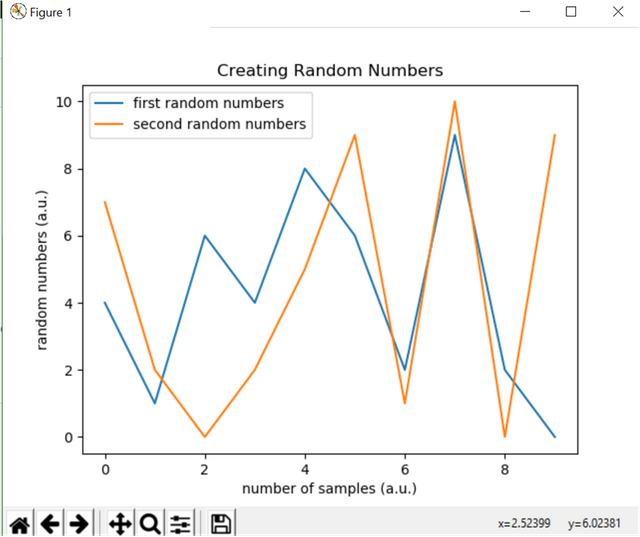 This module is just created for matplotlib.pyplot package. It helps us not to write long name. Ok, let's what we got after plotting. As you see the figure, there are 2 numbers between 2 and 1 which is 1 for our example, 1 number between 4 and 3 which is 3 for our example, 1 numbers between 4 and 5 which is 4 for our example, 1 numbers between 5 and 6 which is 5 for our example, 2 numbers between 6 and 7 which is 6 for our example, 2 numbers between 7 and 8 which is 7 for our example and 1 numbers between 8 and 9 which is 8 for our example. When you sum of # of numbers you will get 10 numbers. 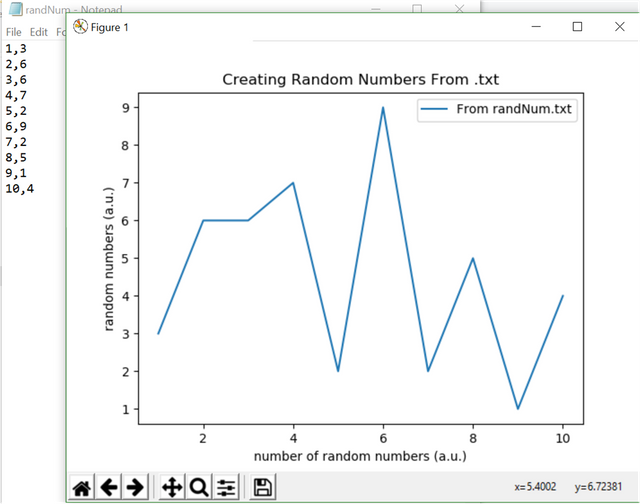 Now, let's learn how to get data from a .txt file and plot it. First of we need to create a .txt file. You can create whatever you want. Just you need to know the spacers such as "," or ":" or ";" etc. Because when yu call your function you need to tell the spacer charachter for the method. Now, let's create an example which will include these methods about a fft analysis. This example is can be useful if you are engineer and you can use this as a sound analysis. As you see the figure, we just find the peaks of the specific frequencies. For example, voice recognition program also use this method to understand what you said like "siri" for IPHONE. Here is the list of related tutorials we have already shared on Utopian that make up a Course Curriculum. Participate on Discord. Lets GROW TOGETHER! I have too many favorites to name. Gracias por el tutorial amigo @onderakcaalan, saludos que tengas un lindo dia.